"Strong Schools Build Strong Communities"
I’d been hearing great things about Fairfax County School Board (Mason District) Democratic candidate Ricardy Anderson, and after sitting down for lunch with her yesterday for a couple hours, I can confirm that those great things were absolutely accurate. Anderson is, in short, incredibly impressive and would make a superb addition to the Fairfax County School Board from the Mason District (replacing current School Board member Sandy Evans, who is retiring). Which is why I’m very confident in endorsing her for this position (note: the Mason District Democratic Committee will meet to vote on its endorsement recommendation on April 24; the other Democratic candidate is Jessica Swanson). So…why Ricardy Anderson? First of all, she knows education – and Fairfax County public schools – inside and out, with two young children in the school system and also having “walked the walk” (she told me at lunch about her experience literally “walking the building,” and how that’s such an important thing to do in order to listen and to be present) for many years — as a teacher, administrator and principal. And she vows to continue walking that walk – literally – when she’s on the School Board, by visiting a different school and spending a day there every week, which of course is a great way to really get a feel for what’s going on…actually showing up and listening. But how, you ask, is Anderson going to have time to do this, given that the Fairfax County School Board is (theoretically) a part-time job? Because, in part, Anderson has vowed to be a full-time school board member, something she’s able and willing to do, even for what I would argue is an absurdly low salary and a ridiculous assumption that running one of the largest school systems in the *country* should be a part-time job. Second, in speaking to Anderson, her passion, enthusiasm, energy, expertise, knowledge, dynamism and deep caring for kids and for schools just comes pouring out. Part of this, undoubtedly, comes from her own background as the daughter of immigrants (from Haiti) for whom English wasn’t their first language and for whom navigating the school system was a brand-new, somewhat mysterious and confusing, experience/struggle. This background and perspective is important in and of itself, of course, but particularly so in an incredibly and richly diverse place like Mason District – around 30% Latino, 18% Asian or Pacific Islander, 11% African American and 38% Caucasian, with around 44% of Mason District residents foreign born and with one of the highest child poverty rates in Fairfax County. Which is also why it’s so important to have someone, like Ricardy Anderson, who both reflects and strongly believes in the value of diversity – and in making sure that everyone knows how great diverse schools are – representing that district on the school board. It’s also worth noting, in a positive way, that Anderson is a reluctant candidate, not in terms of her passion and dedication to doing a great job of course, but in seeing herself as a politician (e.g., she is *not* looking at this job as a “stepping stone” to higher office), which she stressed repeatedly to me at lunch that she absolutely is not. So why run for office then? Simple: because that’s the way she believes she can make the most difference, for the better, in as many Fairfax County kids’ lives as possible. And because she believes strongly that – as she likes to say – Strong Schools Build Strong Communities. In our discussion, we also talked about the importance of “greening the schools,” which Anderson strongly supports; for keeping schools a safe learning environment without doing things like arming teachers or turning them into fortresses; for standing up for special-needs kids; for ensuring equality and safety for LGBTQ kids; for making sure that teachers can afford to live and teach in Fairfax County; and lots more. “A good portion of House of Delegates District 53 covers the Mason District and includes schools in the Falls Church pyramid. Our long-time school board member Sandy Evans has announced her retirement at the end of this year. My choice to succeed Sandy is Ricardy Anderson. Delegate Marcus Simon and School Board Candidate Ricardy “Rickie” Anderson. I am not normally in the business of endorsing candidates for school board positions because to be honest many are not educators and I am not always sure how much they understand about what it truly takes to work in a school day to day. I am not saying school board candidates have to be educators, and I have known many whose hearts are truly in the right place, but I just don’t normally publicly endorse school board candidates. I believe that if we are going to start to move the needle toward true equity and excellence for all students, our school boards have to have some representation of former educators who have worked in the trenches in schools and believe that we have to abandon the idea of isolated teachers in favor of teams of teachers doing the right work in order to take Collective Responsibility for all students. This morning I had the opportunity to spend over three hours with Ricardy Josma Anderson (full disclosure) a parent whose children go to my former school, Mason Crest and a former public school principal who is now running for the school board(Mason District) in Fairfax County. I don’t live in Fairfax and cannot vote but have a vested interest in Mason Crest, the Mason District and Fairfax as a whole since I spent almost half of my career in the district. Mrs. Anderson’s passion to help ensure equity for all (and before people say she wants all kids to get the same thing -stop it!) giving kids what they need when they need it, Kid by Kid, Skill by Skill, not because of a label, but ensuring that all students who are expected to be independent adults one day are given access to grade level essential curriculum in order to have a chance to be successful. Students who have mastered essential skills in an area will be challenged appropriately but it won’t be because of a label it will be because the team based on team developed common assessments will know what skills to Target! Our conversation centered on Mrs. Anderson asking lots of questions, about supports and resources schools needed to be successful, showing that she is a listener and learner. She also shared her experiences as a school based administrator which she has many. These experiences are invaluable in seeing the big picture of the wonderful opportunities and immense challenges that are present in schools today. It was as if we were to “seasoned veterans” on a porch discussing our craft, our wonderful profession and the quality of people it attracts but how we are losing many because of our traditional educational cultures, mindsets and structures that needs to be abandoned and/or deconstructed. Mrs. Anderson was still very optimistic at the possibilities for our children and our teachers if the right conditions continue to be nurtured and/or cultivated in schools and districts. 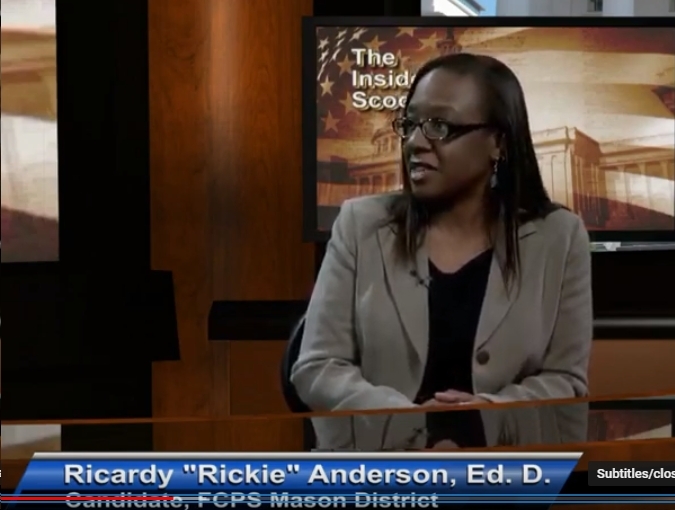 If you live in Fairfax County and live in the Mason District section of Fairfax, please consider the information below, as I am highly supportive of Ricardy Anderson’s candidacy for a seat on the School Board! Her focus… Kids All Kids!